In the part of the world where we live and learn, it seems all our experiences are similar. We were wanting to meet something different. We were more than happy to share our world, and learn about another part of the world. But how much time and patience, and how many ideas were needed to overcome the challenges that surrounded our vision. Our joint class at the Empowering Children School connected with Mrs. Ihrie’s class at Burn Elementary School, in Bunn, North Carolina. The connection began with enthusiastic pupils very eager to share their world. 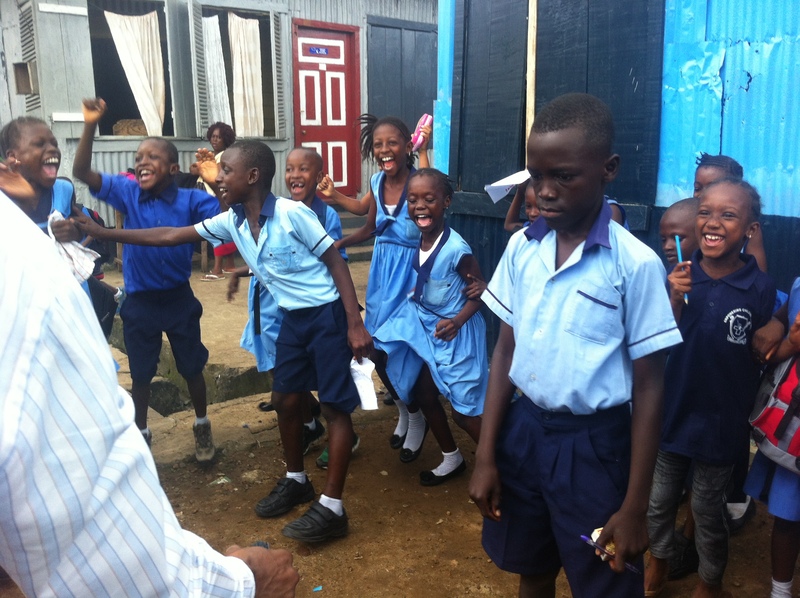 But to the pupils on the other side in Sierra Leone the question “how could that work?” needed brainstorming. The only tools we had available were a blackboard, text books, exercise books, chalks, a smart phone and a camera in a classroom where the student teacher ratio is 30 is to 1. How can a class of 30 use a smart phone to share their world? The Internet café which is another option, a 15-20 minute walk and would allow only a few people inside, and even the few people allowed would have to wait if they met users. Thinking about the time difference and expenses made the majority vote for the smart phone in school…. but the smart phone how? Knowing the capabilities of the device, the advantages and disadvantages, then the ideas came. We divided into groups and shared tasks at hand. Some worked on photographs at the market to share different types of food, and some worked in school to share different types of games, etc. With several e-mail exchanges and other applications like live Skype video conferencing, we felt a real connection. A cross section of classes have been participating in similar activities, so we had to invite pupils from those classes for tips on the best ways to go about it. A lot was shared and learned. The online exchange tied a wonderful friendship. Then in late 2016 we went for a holiday, but before we left a package was sent from Mrs. Ihrie’s class, and it arrived by the time we returned in 2017. Many treats, books and markers were sent, and information about the United States of America was shared, and an iPad. The iPad improves our classroom visual display, keyboard comfort, and appears to be a promising and powerful tool to help us achieve our dream. It will now help us share stories, meet people, and engage our class in collaboration and project based learning activities, read and communicate, and a lot that we have yet to discover. The iPad makes it seems like we are in a plane exploring the globe. Of course as global citizens we need to. 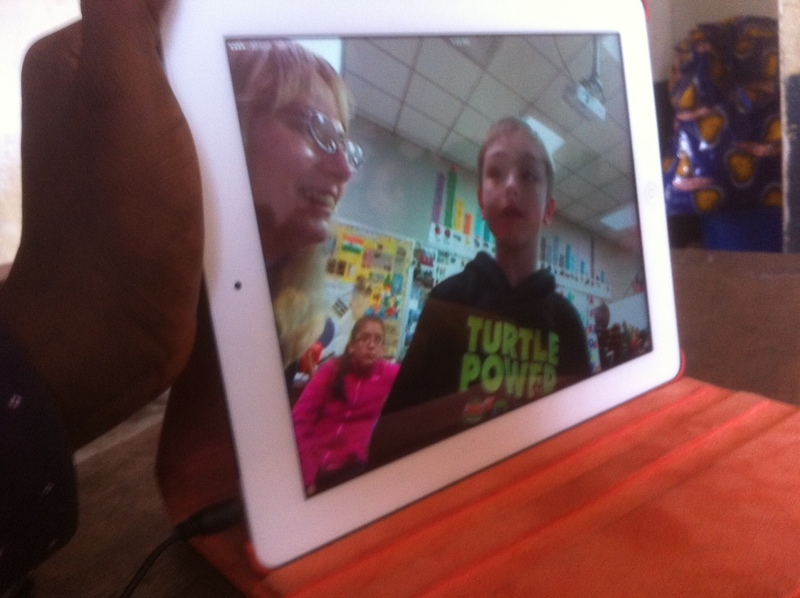 Via Skype, our friends let us meet their school librarian, or medial specialist. She showed us a selection of books, and read amazing stories to us. For the pupils in our class it was their first experience meeting a librarian. Our students discussed the first chapters of the books they sent our class. We thank Mrs.Ihrie and her whole class for such a wonderful opportunity!